For more than 15 years, LexJet has been helping creators of inkjet prints choose the most cost-effective way to protect valuable prints from damage due to scratching and exposure to UV light, humidity, and airborne pollutants. Photographic and art prints can be protected with traditional framing systems, laminating films, clearcoats, or protective sprays. 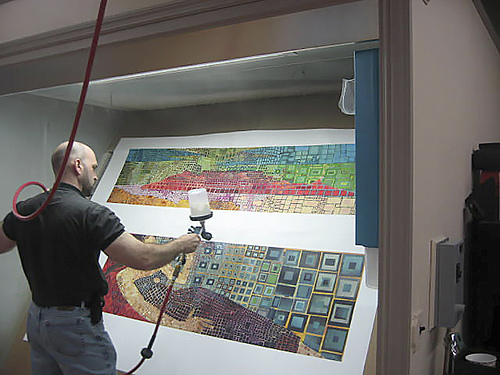 Protective sprays may be fine if you occasionally make a few smaller prints, but liquid clearcoats are the most popular option for studios that use wide-format pro-model inkjet printers to produce multiple, large photographic and art prints. LexJet recently introduced Sunset Gloss and Sunset Satin liquid coatings that provide great protection, while taking some of the hassle out of the application process. The coatings are ready to apply straight from the can, without any dilution or mixing. This is important, because every time you add water to a liquid coating, you’re adding an uncontrolled variable that can diminish the level of protection the coating was engineered to provide. The finish of Sunset Gloss and Sunset Satin Coating is tough and flexible, contains UV inhibitors for maximum protection from the elements, and is non-yellowing. The coatings were designed for use with LexJet’s Sunset canvases, but also work well with other canvas products as well as certain photo and fine-art papers. Why do you recommend a liquid coating instead of an aerosol spray? Aerosol sprays and liquid coatings essentially serve the same purpose—to protect the image. But with aerosol coatings, it’s very difficult to get the correct amount of solids to produce a good protective film. It typically requires more coats to accomplish the same desired result. Liquids are more cost effective, and can either by applied with high-density foam rollers or sprayed on through systems that can be purchased at home-improvement stores. While LexJet sells protective sprays from Hahnemuhle and Clearstar, we currently don’t offer Sunset Gloss or Satin Coatings in spray form. What’s the best way to apply a liquid coating? If I were building a printmaking studio from the ground up, I would include an enclosed, well-ventilated dust-free area in which I could use an industrial HVLP (high-volume, low pressure) spray-gun. An HVLP spray gun wastes less coating in overspray than other types of sprayers. It also provides control over the application process. But since most photographers don’t have room in their studios for spraying (and can’t justify buying specialized coating systems), Sunset liquid coating has been formulated to work equally well when applied either with a spray gun, brush, or foam roller. Developing the right technique with a roller can take some practice, and a lot will depend on the temperature and humidity of your work environment. In LexJet’s In Focus newsletter, you can read some helpful tips about rolling on a clearcoat. What are the most common causes of errors? The three most common errors are using incompatible materials, coating the print before it is fully dry, and applying the coating unevenly. Incompatible materials: LexJet Sunset Coating is a water-based coating. If you apply a water-based clearcoat to inks and papers that aren’t water-resistant, you can easily ruin the print. LexJet sells a wide selection of photo papers, art papers, and canvases that can be protected with LexJet Sunset Coating. A LexJet account specialist can tell you if the combination of ink and materials to use for your prints will work with the LexJet Sunset Coating. Not waiting long enough for the print to dry before coating it: Different inks dry at different rates, especially if you’re working in an area of the country that experiences wide variations in temperature and humidity. Even when your print feels dry to the touch, it may not be ready to clearcoat. You need to make sure your print has properly “outgassed” before you apply a liquid coating. Outgassing is the process in which the glycols used as wetting agents in the inks are evaporated. If the glycols haven’t completely outgassed before you apply the coating, your finished print could look cloudy. To test whether a print has outgassed, some fine-printmakers suggest this technique: Lay each print on a flat surface, then cover the print with inexpensive butcher paper. The evaporating glycols will cause ripples to appear in the butcher paper. Periodically replace the wavy butcher paper with a fresh sheet of paper. If no waves appear in the fresh sheet of paper after a few hours, the print has probably finished outgassing and will be dry enough to clearcoat. Applying the coating unevenly: If some areas of the print have a different sheen than others, you most likely applied the coating unevenly. What are the advantages of clearcoating? A properly formulated clearcoat can add years to the life your fine photo print or art canvas by protecting it from everyday hazards, such as fingerprints and scratches or exposure to sunlight, humidity, and airborne pollutants. A glossy clearcoat can enhance the density of the blacks and the vibrancy of the colors in your print. But if you don’t want your finished print to look glossy, try applying a layer of Sunset Gloss, finished with a layer of Sunset Satin. 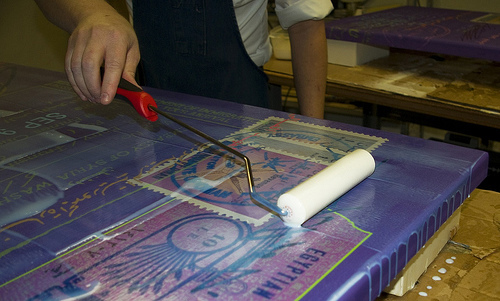 The sheen of the finished print is determined by the sheen of the final coat. The key to getting the best results is to experiment in your own environment. The self-leveling properties in LexJet Sunset Coating can help you achieve optimal results, but the best techniques for applying Sunset coatings will depend on the specific conditions within your work environment. If you have any questions or coating techniques you’d like to share, we would welcome your comments! Alex Ried is LexJet’s product manager, with nine years of experience researching and developing inkjet media for use in the photography, fine art, in-house corporate and large format inkjet markets. I use a Canon i9900 13″ x 19 inkjet printer for glossy, matte and canvass prints. Please advise sutiable UV coatings to prevent fading. I am an artist and have giclee prints on canvas and paper by Communicorp (Columbus, GA). I have one piece with a black background that “scratches” with just the corner of the paper coming across the surfact. Will this coating prevent this? Will this coating protect the print (on either canvas or paper) from water damage? Will it provide any level of waterproofing protection at all? I’ve been working with a local seamstress to make photo purses. I make photo prints on Hahnemulhe Daguerre canvas, and she sews them into a purse pattern. 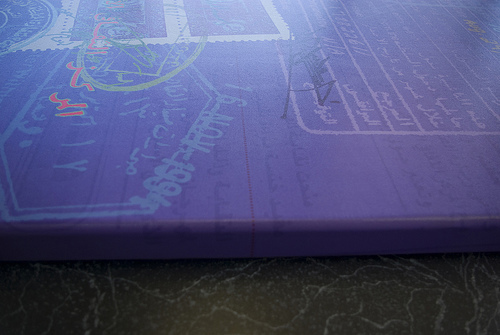 We’ve been using PremierArt Printshield sprayed onto the canvas, but the purses still aren’t very durable. Would the Sunset coatings work better for a print that’s going to be flexed and scuffed and generally given a workout? For a product like a purse that’s handled constantly, the durability will increase if the product is coated more than once with LexJet Sunset Coatings. However, it will not be able to be washed in any way, nor will the coating provide you with any guarantee that the product will not show signs of wear on a short-term basis. Products from inkjet printers are not meant to be handled constantly. The more typical inkjet application is for display, so although our coating will help your solution it may only be a temporary to moderate fix. The more coatings you put on, the harder the topcoat will be, but be sure to let each coating dry before applying another. You will need to either roll it on with a foam roller prior to making the purses or spray on with an HVLP compressor powered gun. I would advise you to set your customer’s expectations that these are not to be washed or dry cleaned as this will ruin the inks and coatings. A great alternative is dye-sublimation printing, which embeds the ink in the fabric, allowing it to be washed and handled repeatedly. Its only weakness is that the images will fade if exposed to outdoor light for prolonged periods of time. Keep an eye out here at our blog over the next few months as there are washable inkjet fabrics that can be repeatedly handled coming down the pike that may fit the bill for your application and lots of others. Can LexJet Sunset Gloss and Satin mix together instead of applying a layer of Sunset Gloss and finished with a layer of Sunset Satin? Hi Jeff… Sunset Gloss and Sunset Satin Coatings can be mixed together. Just make sure both are mixed well prior to mixing them together. Are the Sunset Satin/Gloss liquid coatings suitable for applying to outdoor vinyl/polypropylene banners (printed with aqueous pigmented inks)? can you use this product on canvas printed with hp latex inks? One of the main benefits of printing to canvas with HP Latex inks is that you do not need to coat it for protection like you do when printing with an aqueous printer, therefore, you eliminate a step in the production process. However, if you are looking to change the finish of the print, from a satin to a gloss or vice versa, Sunset Gloss or Sunset Satin Coating are compatible with canvases printed with an HP Latex printer. Another option would be to print to a satin or gloss canvas so that you do not need to change the finish. Can water-based clear coats like Sunset Satin be applied to banners printed on an eco-solvent printer? I believe the material we’re using is a vinyl-based smooth banner. It should work, but the question really is why you need to coat a banner printed with low-solvent inks due to the inherent durability of those inks on a vinyl banner. Let us know if you try it and how it works; the testing of that coating has been on aqueous media, primarily canvas so any feedback would be helpful. I would like to apply to a fine art paper that is mounted to gatorboard to give the photograph the look of texture and brush marks, is this product suitable for this application? Your comment in March of 2011 post includes, “Keep an eye out here at our blog over the next few months as there are washable inkjet fabrics that can be repeatedly handled coming down the pike that may fit the bill for your application and lots of others.” Anything available yet in that category? Thanks. And also what are the LexJet papers that I can print on a Canon 8300 and coat (other than the canvases)? Is there a list? Thanks! Can your products be used on large format vinyl banners using epson ink? Our in-house banners are fading much too quickly in our Mid-Atlantic area. Our weather can be brutal as well with frequent thunderstorms. The ink doesn’t sink in to the vinyl and can be scratched off quite easily. I’m trying to find a solution to help make our signage more durable so that we’re not just wasting all this ink and vinyl. I am printing on Hahnemuhle Bright White Rag, generally with sizes 44″ wide with varying lengths up to 66″. I would like to know if your Sunset Satin product will completely disappear into the print, as does Hahnemuhle’s spray protection, so only the original finish shows. In other words, I do not want to have a sheen of any kind on my prints. With the sizes of my images, I need something more than a smallish spray can, as you’ve noted, to properly coat my prints. The Sunset Satin Coating will not completely absorb into the material. After the coating dries there will be a satin finish left behind. If you are looking to stay with a matte finish, I would recommend Clearshield Canvas Guard and use a high-density foam roller for application.